Christianity is faith in the Creator Spiritus, from whom comes everything that is real. Precisely this ought to give Christianity its philosophical power today, since the problem is whether the world comes from an irrational source, so that reason would be nothing but a "by-product" (perhaps even a harmful by-product) of the development of the world, or whether the world comes from reason, so that its criterion and its goal is reason. The Christian faith opts for this second thesis and has good arguments to back it up, even from a purely philosophical point of view, despite the fact that so many people today consider the first thesis the only "rational" and modern view. A reason that has its origin in the irrational and is itself ultimately irrational does not offer a solution to our problem. Only that creative reason which has manifested itself as love in the crucified God can truly show us what life is. There is no question here of setting faith against reason. But the point about evolution is that it tends to transmogrify into "evolutionism", a Theory of Everything that purports to explain even religious faith as the product of material forces. If the evolution of species is more than just a theory, this ideology of evolutionism is less than a theory; it is an hypothesis, and a poorly grounded one. People believe it mainly for the reason that they cannot see any alternative type of explanation as even possible. More on this phenomenon another time. In the thirteenth century, Bonaventure maintained that all of the non-theological arts and sciences taught in the university find their proper center in theology, that science which speaks directly of Christ the Logos. As the rationality of God the creator, Christ is the physical, mathematical, and metaphysical center of the universe and hence the point of orientation for all of the sciences dealing with those dimensions. In the nineteenth-century, at the high-water mark of modern foundationalism, John Henry Newman felt compelled to call for the re-insertion of theology within the circle of university disciplines. Following the inner logic of Christian revelation, Newman, like Bonaventure, saw that theology not only should be around the table, but must be the centering element in the conversation, precisely because it alone speaks of the creator God who is metaphysically implicit in all finite existence. A few lines later he adds: "Newman saw that once theology is displaced, some other discipline necessarily takes its position at the center and thereby disturbs the proper harmony among the sciences, for no other discipline has the range or inclusiveness properly to hold the center." The same argument is made powerfully in Alasdair MacIntyre's recent book, God, Philosophy, Universities. But what is this "proper" harmony that Barron appeals to? Why is only theology capable of "holding the center"? The point is that, while theology cannot determine the methods or content of the individual sciences, it alone is concerned with that which transcends them all. It is a place-holder for that which connects everything - for what Barron terms "co-inherent relationality." Theology as a formal discipline is a quest for that relationality. Without it, rationality itself fragments and falls apart. Icon by Solrunn Nes (www.icon-painting.com). "Just as the Virgin was called to offer herself entirely as human being and as woman that God's Word might take flesh and come among us, so too philosophy is called to offer its rational and critical resources that theology, as the understanding of faith, may be fruitful and creative. And just as in giving her assent to Gabriel's word, Mary lost nothing of her true humanity and freedom, so too when philosophy heeds the summons of the Gospel's truth its autonomy is in no way impaired. Indeed, it is then that philosophy sees all its enquiries rise to their highest expression" (John Paul II, Fides et Ratio, 108). I thought it would be worth drawing attention to some notable new initiatives in education. First, the Living Water College of the Arts in Alberta, Canada. This is committed to the training and development of Christian artists across a wide range of genres including theatre and film. Second, the C.S. Lewis Foundation in California has announced the creation of C.S. Lewis College in Northfield, Massachusetts dedicated to "mere Christianity". Third, there is the Theotokos Institute for Catholic Studies at St David's Catholic sixth-form College in Wales, dedicated to "theology before division" (of the Christian east and West, that is). Fourth, from within the Orthodox tradition, the Cappadocian House of Studies in Art and Nature (at the moment more of an aspiration than an actual House). Fifth, here in Oxford the demise of the Franciscan Hall of the university last year, Greyfriars, has led to two new initiatives - St Bede's Hall and the Centre for Franciscan Studies, which is currently sponsoring a series of lectures in the Taylorian (mine is on 24 May). "...since beauty and delight do not exist without proportion, and since proportion exists primarily in numbers, all things are subject to number. Hence 'number is the principal exemplar in the mind of the Creator,' and in things, the principal vestige leading to Wisdom. And since number is most evident to all and very close to God, it leads us, by its sevenfold distinction, very close to Him; it makes Him known in all bodily and visible things when we apprehend numerical things, when we delight in numerical proportions, and when we judge irrefutably by the laws of numerical proportions." - St Bonaventure, The Journey of the Mind to God. Technology is far from neutral, as it is frequently assumed to be in both popular and scholarly writings on this subject. “The medium is the message” (McLuhan), and a technology is not simply a technique that may be employed for good or ill. It bears within itself a value system and a worldview - perhaps even a metaphysics and a theology. Telephone, television and the internet, for example, change our sense of space and time, and have a variety of effects on the relationships within the family and the wider social community. Some of these effects will be humanly beneficial, others less so, but an assessment of the technology is not possible without paying attention to the overall pattern of these effects, and to the purpose or function of the technology in relation to the purpose of human life itself. In what respect is a given tool actually serving the true end of man? As a matter of fact, I think the portable computers we all use now are a great boon, and I could hardly do without mine. But this does not stop me noticing that this very dependence is a kind of warning sign. We are addicted to technological change in a much more serious way than simply psychologically. This makes “technology assessment” impractical, to say the least. We are running too fast to stop and assess anything – if we are not to stumble over our own feet and be left behind in the race, we have to assume we are running in the right direction. But Lewis is no Luddite. He thinks another kind of science and technology is possible. He goes on, “The regenerate science I have in mind would not do even to minerals and vegetables what modern science threatens to do to man himself.” Goethe and the Romantics were on to something. My book is trying to point in that direction, to encourage us to reflect on the elimination of formal and final causes from science, and the disconnectedness of our lives, and to begin to imagine another way of doing business, another way of making scientific progress – a “regenerate” science, perhaps. The "way of beauty" is the theme of the Pope's recent address to artists on 21 November 2009 in the Sistine Chapel. In it he writes - quoting both Hans urs von Balthasar and Simone Weil, who are influences on the book on which this blog is based (see left), and building on the Letter to Artists of Pope John Paul II - as follows: "Beauty, whether that of the natural universe or that expressed in art, precisely because it opens up and broadens the horizons of human awareness, pointing us beyond ourselves, bringing us face to face with the abyss of Infinity, can become a path towards the transcendent, towards the ultimate Mystery, towards God.... In this regard, one may speak of a 'via pulchritudinis,' a path of beauty which is at the same time an artistic and aesthetic journey, a journey of faith, of theological enquiry.... Simone Weil wrote in this regard: 'In all that awakens within us the pure and authentic sentiment of beauty, there, truly, is the presence of God. There is a kind of incarnation of God in the world, of which beauty is the sign. Beauty is the experimental proof that incarnation is possible. For this reason all art of the first order is, by its nature, religious.'" 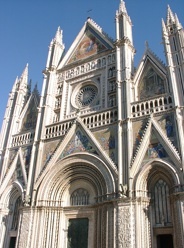 The Pope has also recently spoken very eloquently of the beauty of the medieval cathedrals, one of which, the Cathedral of Orvieto, is featured in the photograph. There he speaks of "a much broader form of reason, in which the heart and reason come together. This is the point. This, I think, is in some way the proof of the truth of Christianity: the heart and reason come together, beauty and truth touch. And to the extent that we are able to live in the beauty of truth, so much more will faith again be able to be creative, in our own time as well, and to express itself in a convincing artistic form." Readers of my book and blog might be interested to know that a colleague and friend, David Clayton, with whom I worked on these ideas in Oxford, is now the Artist in Residence at Thomas More College of Liberal Arts in New Hampshire. There he has developed a course based on the traditional quadrivium called THE WAY OF BEAUTY. He writes, "Literature, art, music, architecture, philosophy—all of creation and potentially all human activity—are bound together by this common harmony and receive their fullest meaning in the Church’s liturgy. This course teaches a deep understanding of these principles and their practical application through both lectures and workshops." If you follow the link you'll find out more about this wonderful educational initiative. David's articles can be found on the New Liturgical Movement website and are permanently linked from my Links list on the left. David is also the author of a Distance Learning programme called ART, BEAUTY AND INSPIRATION offered through the Maryvale Institute in the Archdiocese of Birmingham. There is also a recent interview with David on Zenit. An interesting article inspired by David Clayton's writing and that of Robert Sokolowski is available on Jake Tawney's blog, entitled "Content and Form - From Linguistics to Abstract Art". 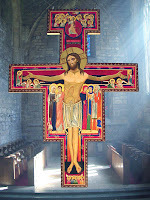 Image: Icon at Pluscarden by David Clayton, based on the crucifix at San Damiano. Sitting in an airport recently for several hours - a perfectly smart, pleasant, efficient airport - I had occasion to look around and realise something. Not only could I have been in almost any country of the world, and therefore I was in some sense "nowhere", but I was in a space where signs predominated over symbols. Everywhere I looked there were signs: pictures, advertisements, instructions, those little "icons" that tell you where the toilets are, or ground transportation. But the whole place had been constructed with absolutely no sensitivity to the natural symbolism of shape and number and light. Of course, that didn't mean that symbolism had been eliminated, just that it was inadvertent. The modern world tends to eliminate symbolism, because symbols, unlike signs, point us to something outside this world, something deeper and more real than toilets, or things to buy. The final elimination of symbols that speak of the transcendent has not yet taken place, but the recent judgement of the Court of Human Rights that Italian schools must remove crucifixes from their walls shows that the struggle is intensifying. A crucifix may be treated as a sign, in which case it points to the social phenomenon of Christianity, much as a Union Jack represents the United Kingdom. This is how it is being treated by the Court - as the flag of Christianity. 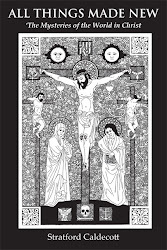 But the crucifix is also a concatenation of symbols, a symbol par excellence, the symbol of symbols. In a way, the attack on the crucifix is itself symbolic - of an attack on symbols in our culture. It is more important than ever that our education should give special attention to cultivating the symbolic imagination. James Taylor's Poetic Knowledge is a helpful resource. What he calls "poetic knowledge" is the intuitive, tacit, connatural way of knowing that tends to be neglected in the pursuit of mere information. Catechesis, too, needs to take more account of the symbolic dimension of scripture and the sacraments. More on that another time. There is a noticeable ugliness in much 20th-century architecture, design, and town planning that expresses a deeply rooted problem in the way we have learned to think. The problem, as I try to show in my book, can be traced back to Descartes (or even further to William of Ockham). If I may caricature somewhat, Descartes lay the foundations of modern instrumental reason by reducing everything to positions on a conceptual grid. Very efficient, very helpful - like putting the world on a slab in order to conduct a post-mortem (or vivesection). The industrial method is similar - for the sake of mass production and division of labour (sometimes called Taylorism). This is what Christopher Alexander says about it: "Mass production, high industry, and lower craft techniques advocated in the 20th century, as a result of Taylorism, led to a world where it was thought efficient or good to make things out of massive ultra-simple elements like huge prefabricated concrete panels, which would then be joined in the simplest ways, and without significant differentiation at the joints..." Everything has to fit into "brutalized rectangles". On his website and in his books, such as Pattern Language and The Nature of Order, listed in the Links section, you will find Alexander's detailed analysis of this phenomenon and his solution to it. The contrast between buildings produced from the Cartesian analytic mentality and, for example, the medieval Gothic cathedrals or the works of Antoni Gaudi in the 20th century could not be more extreme. The latter are participatory and organic in conception and execution, as is nearly all traditional architecture the world over. There are lessons here not only for architects and designers of sacred spaces, but for those who design buildings for secular use, and even for managers of organizations and communities. Please note that I am not saying that all modern architecture is ugly, or that Gothic is best, but that by comparing the worst of the modern with the best of the ancient and medieval, we can learn something true and useful. I was just alerted to an important new book by one of the great educational philosophers of our time. Called God, Philosophy, Universities. It is a kind of introduction to the Catholic philosophical tradition, based on an undergraduate course that MacIntyre teaches at Notre Dame. An informative review by Mark Eckel may be read here. Eckel writes: "Key to a Christian university is the unity of the universe and the underlying unity of all subjects of study.... The origin of division (begun in Genesis 3) is dualism – separating the human person into pieces and parts – which destroys 'the unity of the human being,' and is antithetical to the Christian view of unity." An article by MacIntyre on Newman and education can be found here. Anyone who wants to discuss the educational implications of Beauty for Truth's Sake can now do so at our discussion board under EDUCATION. 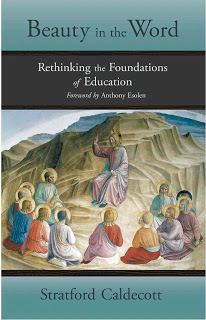 In connection with this you might like to read an article I wrote some time ago in Communio called Towards a Distinctively Catholic School. But these ideas on education are not just for Catholics - and not just for schools and colleges. Parents are the primary educators of their children, and the home is the natural place for a revolution in education. If you want to be involved in the discussion with and among homeschoolers you can append a comment here, send me an email, or post something in the education forum. Recently I also became aware of a growing Catholic UNSCHOOLING movement inspired by the work of John Holt. According to Suzie Andres, the author of Homeschooling with Gentleness, "St. Thomas and Aristotle both clearly affirm the following four educational principles: 1) education should be for the good of the learner; 2) all men by nature desire to know; 3) the learner is the principal agent in learning; and 4) different learners are fitted to learn different things at different times." These principles underpin the case for "unschooling", the "Little Way" of homeschooling as she calls it, which is based on trust - trust that a child will seek out and learn what he or she needs to know, when he needs to know it, without coercion, without school or school-type methods, in the freedom and safety of his family. The role of parents is to facilitate this exploration of the world. This won't work for some families and some children, but I can imagine it working for others. After all, every subject is connected to every other, and one thing leads to the next. Give a child a globe for Christmas, and it may lead to an interest in geography, or history, or astronomy. Start them on a musical instrument, and it might open up mathematics or history. Drawing a circle or triangle points to architecture or theology. In fact the principles of unschooling are very close in some ways to the idea of my book, which is all about interconnectedness and lifelong, self-motivated learning. Picture by Rose-Marie Caldecott. Rights reserved. As Mr Caldecott says, we have lost a sense of who we are and how we fit into the cosmos. There is no mystery about why this has occurred: it follows naturally from the Darwinian view that we are merely the product of blind forces, rather than the deliberate creation of a loving God. The key is not, as he suggests, to highlight the complementary relationship of the arts and sciences, their common search for beauty, and the attraction of elegant solutions that please the heart: much of Darwinism’s superficial attraction lies in the fact that it appears to satisfy all these criteria, while clearly leaving no room for religious belief. Rather, we should be highlighting the latest research in such diverse fields as information theory, biochemistry and cosmology, which provide compelling evidence for traditional Catholic teaching on mankind’s unique status within God’s creation. Until we (and the Church generally) grasp this nettle, it will not matter one jot how many “humane and intelligent alternatives to the increasingly oppressive secularism of our schools” are devised: our children will continue to regard religious belief as fundamentally irrational. I don't entirely agree. In an article called "Theories of Evolution" I suggest that Darwin does leave room for religious belief. We do not have to take Richard Dawkins at face value, nor ignore the presence of respected theistic evolutionists such as Simon Conway-Morris (Cambridge). Darwin himself seems to have lost his faith for other reasons than the theory of natural selection. Atheistic evolutionism is a symptom and result of the split in our culture that I was writing about in that article and in my book - the three-way split between science, art, and faith. Unfortunately the debate on evolution too often gets bogged down in the discussion of atheism vs creationism or intelligent design. It needs to be broadened out, with reference also to psychology, neurophysiology, the nature of the soul and the human person. Religious believers have nothing to fear from facts discovered by modern science, although we must be wary of some of the interpretations that may be placed upon them. Materialist theories of evolution in fact make sense only to people who lack a sense of spiritual forms or essences. If that whole dimension is closed to our minds, if there is no conception of what might be meant by “vertical causation” (formal and final causes working together with material and efficient ones), then naturally there is nowhere else for species to come from than below, through a combination of chance and necessity. The successive temporal unfolding of species does not prove the truth of the theories that are adduced to explain it. The inner form that makes a species what it is exists eternally, however it comes to be manifested in space and time. 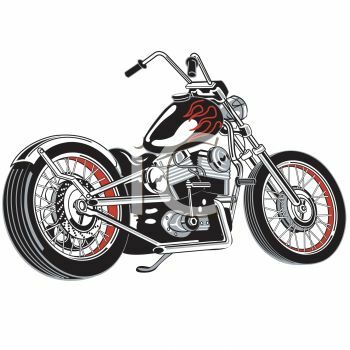 Beauty for Truth's Sake echoes in places that cult philosophy book of the 1970s, Zen and the Art of Motorcycle Maintenance, by Robert Pirsig, which you can read online here. (Coincidentally there is a conference in Oxford this October comparing Pirsig's ideas on Quality with those of the art historian Ernst Gombrich.) In the course of his Chautauqua, the author seeks to resolve what he calls the "classic-romantic split" in our culture - the world of technology and science, and the world of feeling and art. He finds a solution in the notion of Quality. Phædrus... felt that the solution started with a new philosophy, or he saw it as even broader than that - a new spiritual rationality - in which the ugliness and the loneliness and the spiritual blankness of dualistic technological reason would become illogical. In the Catholic Herald recently I published an article arguing that the task of "evangelizing" - that is, communicating the Christian faith - is made more difficult by the split between arts and sciences. "Faith became detached from reason, and reason turned against faith, as a result of the scientific and technological revolution. The intellectual elite accepted the philosophers' suggestion that truth has nothing to do with goodness or 'facts' with 'values'. Art was reduced to entertainment, and science to the quest for power over nature. But reductionism never worked completely: there was always something important left out. In reality, both art and science never stopped searching for beauty, and that is an important clue to the healing of education. Beauty leads beyond the surface of things, into their hidden depths. Human beings are made for more than science or art can offer on their own, and once we recognise that both point to a meaning beyond the world, the religious question is opened up once more, and the gospels begin to make sense." "Rilke was not mistaken when he identified as one the sphere of the angels and the sphere of all that is beautiful. 'For the beautiful is nothing but the first degree of the terrible.' The world of beauty is the world of intermediate hierarchies which are irradiated with the glory that cascades down from the Trinity even into the formless opacity of matter. The beautiful is the world of forms between that which above form, being the sphere of God, and that which has no form at all, being mere matter. The modern world shuts out intermediate order. It recognizes nothing between scientific thinking and mystical possession, and in so doing denies completely the sphere which it is the function of art to reconstitute by giving back to the universe its depths." It seems to me that one of the things a teacher can do to "re-enchant" education is draw his students' attention to the world we live in, and to the world we have built around us - the language of form in architecture. We can connect this easily with mathematics, geometry, astronomy, music, and history. An article by philosopher John Haldane in The Catholic Herald for 30 August 2009 even gives us a way to connect it with biology. The architects of classical antiquity and of renaissance and later neo-classicism were resolute humanists. For them, man and measure go together, either with man being the measure of all things, or else in his measuring cosmic order through his ability to discern mathematical sequences, ratios and parallels. The principle architectural expression of this abstract ordering is the façade or wall divided into parts: surface and spaces defined by classical geometry. When competently conceived and executed such schemes are undeniably pleasing, like the rhythm of a well-ordered rhyme. But the inspiration is less to do with what is observed in nature than with what is reasoned to through mathematics and philosophy. The Gothic, by contrast, takes its key from the living world of ordered growth. 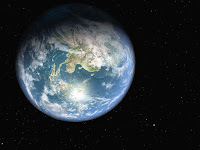 From beneath the earth the germinated seed breaks through, first establishing a stem, then branching, next putting out leaves and buds, then in turn producing flowers and fruits. The order is not one of mathematical design but of organic progression; and it pre-exists invisible but immanent within the seed. Like plants, Gothic buildings grow out of the earth and are developed upwards, drawing material from below but reaching for the light. They represent a recognition of the order of nature and an identification with it; acknowledging and seeking to imitate divine design. Of course, the "living world of ordered growth" is itself a mathematical order, and the Gothic masons probably understood it as such. Nevertheless, Haldane is absolutely right that in a Gothic cathedral we easily imagine ourselves "standing beneath the canopy formed in an avenue of over-lapping trees, or imagine the undersides of the leaves of those trees." And it is surely true that "the power of England's Gothic cathedrals to prompt wonder at the order of nature and to encourage speculation about the source of that order is not altogether diminished. 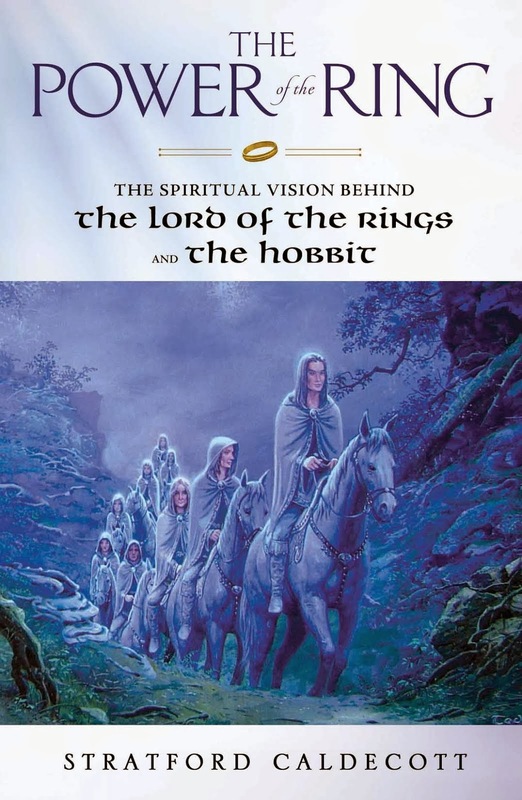 Hundreds of years on from their first appearance they remain sources of theological inspiration and reminders of the possibility of integrating intellect, imagination and sense in the embodiment and recognition of religious meanings." Born in Britain but living in California, the architect Christopher Alexander believes that architecture should be rooted in a profound understanding of the human person as spiritually transcendent, yet intimately related to the cosmos. His book series The Nature of Order (2004) opens with an assault on the mechanistic idea of order, which he traces back to Descartes in the seventeenth century. He argues against this idea that matter and space possess degrees of life, because the elements of which they are made relate to each other as mutually supporting “centers”, making the whole more than the sum of its parts. He illustrates this by means of the patterns in a Turkish carpet and the architectural and decorative features of buildings like the Alhambra and Chartres Cathedral. Alexander defines fifteen structural features that correlate with degrees of life. This enables him to become quite practical in his recommendations. The examples he chooses are eclectic, ranging from mud huts to palaces, from Shaker furniture to Persian glassware, from electrical discharges to cell walls, from the branches of plants to the cracking of mud and the formation of crystals and feathers. He suggests that his approach offers a way beyond Hume’s fact-value distinction. Our feeling-response to things, properly discerned, is an objective measure of their structural wholeness. The implications of all this for education remain to be explored. Take a look at the "50 most extraordinary churches in the world" and see if you agree with your friends on which are the most beautiful! For many of us, “mathematics” and “beauty” sit oddly together. We may remember math as boring or even frightening, but hardly beautiful. Yet math is the key to science, and science dominates our age. And there is another way to look at it. This quotation is taken from p. 239 of a wonderful book called A Passion for Mathematics: Numbers, Puzzles, Madness, Religion, and the Quest for Reality, by Clifford A. Pickover. It is full of games and quotes and ideas that parents and teachers will find useful to get kids of all ages and all backgrounds interested and involved with maths and geometry. Pickover himself believes that “mathematics is the loom upon which God weaves the fabric of the universe” (p. 53). Looking back on the maths classes I sat through as a kid, I can't help wishing I had been taught the subject not as a collection of seemingly arbitrary rules and procedures but (1) historically (starting with Pythagoras), (2) aesthetically (in relation to music, painting, architecture), and (3) symbolically (with a view to qualities, meanings, analogies inherent in numbers and shapes) - not to mention (4) playfully. The religious and secular use of numbers are related, as I tried to show in The Seven Sacraments (Crossroad) as well as in Beauty for Truth’s Sake. The numbers particularly prominent in Christian tradition are 1, 2, 3, 4, 7 10 and 12. One is the source of all other numbers, 2 is the beginning of multiplicity, there are three divine Persons and three theological virtues, four cardinal virtues and four Gospels, seven sacraments as well as seven days of creation, ten commandments, twelve apostles and twelve tribes. And all these numbers are interrelated: 7 is 3 plus 4, 10 is 3 plus 7, 12 is 3 times 4. So in a way the fundamental structural numbers only go as high as 4, and all the others are made up from these. That takes us back to the sacred Tetraktys of the Pythagoreans, whose influence on the Christian tradition has been underestimated. Our children have within themselves, or so I am led to believe by my experience of them, an inner yearning for the beautiful, a potential wonderment and a delicious longing and love and trembling waiting to be empowered on its quest. This yearning is not likely to be fulfilled in a high school hallway or on the shopping mall checkout line. So what if we were to set as our task – as parents and as educators – acquainting our children with the beautiful without and the cultivation of the beautiful – the yearning – within? How might we go about our homeschooling lives differently if we were to conceive of what we are doing as primarily an aesthetic task? Education is a never-ending process – or should be. And what we learn depends largely on what catches our imagination. Not long agoI learned something by chance that changed the way I look at the world. Like many people, I grew up with the idea that the light by which we see things emanates from a source, bounces off the thing I am looking at, and collides with a cell in my retina. Not true, apparently. When a photon hits something, it is absorbed. 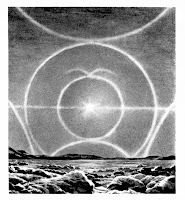 This energy is then radiated back again as light: not the same photons, but new ones. In a way, then, the whole world is glowing. The leaves on the trees are alight. Your eyes are (almost literally) shining like stars. Such a world is much more alive, more beautiful, it seems to me, than the passive, lumpen world I previously inhabited. Matter is active in revealing its colours and shapes to our eye. I think St Denys would have appreciated this. The way light is passed on by matter is an analogy for the way spiritual illumination is passed down his hierarchy of angels: each angel makes the light his own, and illuminates the others by his own gift. It also echoes the pattern of the Trinity, the supreme three-dimensional act of love. In love each gives to the other, each receives from the other. When we see anything, it is because a photon has been received, and a photon given. Light is gift. The word “ecology” was coined only as recently as 1873, by the German zoologist Ernst Haeckel. He based it on the Greek word oikos meaning “house, dwelling place, habitation” (plus, of course, logos). But though the scientific study of ecology, referring to the complex inter-relationships of biological entities with each other and with their environment, is a modern development, the traditional worldview has a great deal to say on the matter. The medievals did not possess posters showing the fragile earth floating in a dark sea of space, but they were deeply aware of the inter-relatedness of the natural world, and of man as the focus or nexus of that world, which they expressed in the doctrine of correspondences. It was, of course, more poetic than scientific in its formulation, but it expressed a profound insight that remains valid, and the present ecological crisis could only have developed in a world that has forgotten it, or forgotten to live by it. The cosmological principles underlying the quadrivium, even today, can help us learn to dwell more wisely in our common home. It is not Taylor’s conviction – and it is certainly not that of Beauty for Truth's Sake – that we can or should do without “rigor” in science or in education; just that we must keep things in right proportion. Contemplative, or poetic, or intuitive ways of knowing can give profound insights into reality. Any education that fails to integrate such knowledge is liable (as most of our schools demonstrate) to produce men and women alienated from their own full humanity and from nature itself. The vesica piscis is one of the most important figures in sacred geometry, and symbolically speaking an image of the source of life. It may best be described as a lens shape formed by intersection of two circles with the same radius, intersecting in such a way that the center of each circle lies on the circumference of the other. The name in Latin means the bladder of the fish. The shape is also called, somewhat more poetically, mandorla ("almond" in Italian). The Mandorla halo, often seen in religious art enclosing Christ or his Mother, is also often taken to represent the womb, and to have been associated with the power of giving birth, since it was used to generate many other numbers and forms, beginning with three and four, the triangle and the square. In Christian art, the area where the two circles overlap may be taken to represent the Incarnation, the beginning of the union of divine and human natures. The figure was the subject of intense mystical speculation among the Pythagoreans and their successors. The mathematical ratio of its width to its height is the square root of 3, the ratio 265:153 being the best possible approximation to this square root using small whole numbers. As a result the number 153 was sometimes called “the number of the fish”. It is probably no coincidence that the number 153 also appears in the Gospel of John (21:11) as the number of fish Jesus caused to be caught miraculously after his resurrection. The writer of the Gospel would hardly have recorded the number if it had not been believed to be highly significant, and its occurrence is suggestive of a Pythagorean or Platonist influence. But why as a Catholic do I speak of “sacred geometry”, a term so associated with the New Age movement? I believe that, as the Pope says in The Spirit of the Liturgy, the “mathematics of the universe… comes from the Logos, in whom, so to speak, the archetypes of the world’s order are contained.” And I agree with Michael S. Schneider that children miss out if they are exposed to numbers merely as quantities instead of qualities, each with a distinct character, connected with all others in endlessly fascinating patterns. Such patterns can awaken us to a world of wonder and beauty, and point to the underlying harmony between science, art, and religion. As you might see from the Comments, Charlotte Ostermann and others are adapting some of these ideas for Catholic homseschoolers. If you are interested to find out more, add a comment of your own, or get in touch directly. In the sidebar you'll find a section where I plan to collect useful ideas for what to do with younger kids to get them interested in all this - not just in geometry, but in the whole process of learning and the development of a vision of how everything connects together. The way we educate is the way we pass on or transform our culture. It carries within it a message about our values, priorities and the way we structure the world. The fragmentation of education into disciplines teaches us that the world is made of bits we can use and consume as we choose. This fragmentation is a denial of ultimate meaning. Contemporary education therefore tends to the elimination of meaning – except in the sense of a meaning that we impose by force upon the world. The keys to meaning are (and always have been) form, gestalt, beauty, interiority, relationship, radiance, and purpose. An education for meaning would therefore begin with an education in the perception of form. 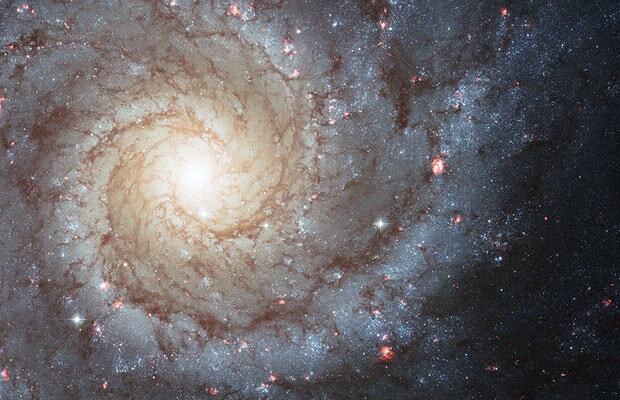 The “re-enchantment” of education would open our eyes to the meaning and beauty of the cosmos. Education begins in the family and ends in the Trinity. Praise (of beauty), service (of goodness), and contemplation (of truth) are essential to the full expression of our humanity. 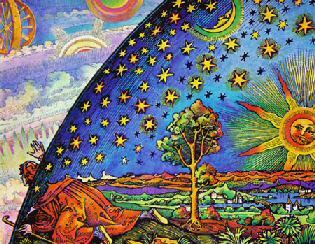 The cosmos is liturgical by its very nature. It is this notion which always held together what we now think of as sciences and arts, and ensured that the topics of the quadrivium always had a qualitative aesthetic dimension. To say that the essence of beauty is in number, as Augustine and, later, Bonaventure and a host of medieval followers do, sounds to us like an attempt to reduce aesthetics to science and formal rules. However, this would be to neglect the fact that for the tradition, number had a qualitative dimension and a mysterious inexhaustible depth. It was in fact the very break up of this tradition which generated the duality of science and art, along with a series of other dualities in which the modern West remains trapped.